Happy New Year to you all. I hope it’s a wonderful year for everyone. On new year’s eve I read a post about a temperature blanket and thought it sounded like a great idea. So I jumped on the band wagon and decided to make one for this year. Basically you make a blanket up according to the temperature of the day (derr lol), I decided to go with a low and high temp one as in Queensland it doesn’t get very cold during winter and my blanket would have been rather plain looking. On January 1st I decided on some colours and wrote a pattern to go with it. Wasn’t really a fan of how harsh the dark brown border was so this morning I changed it. Luckily we are only in day 3 and I didn’t have to redo a heap of squares. There are many designs out there which I came across in search of inspiration. 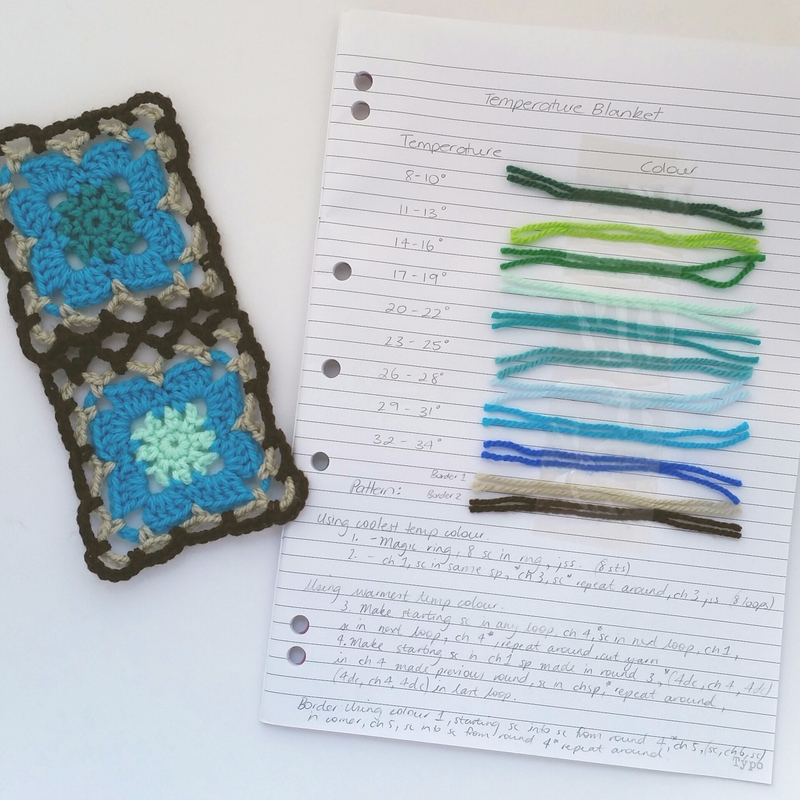 Most are made up of rows in all sorts of stitches and when you work out the math, would have made quite a big blanket, even if just single crochet was used. I know that some crocheters decided on multiple blankets for this reason. 366 squares! Easy, well for me I like to pump out as much as I can, as quick as I can. I like to compete against myself as odd as that sounds. Be the best I can be! Haha sort of thing. But I’ll have to take my time with this one. 366 doesn’t work nicely into a square or rectangle I hear you say… no, no it doesnt. So to even things up a little, I’ll be crocheting special squares for special events such as this baby’s birth, other children’s birthdays, celebrations etc. I will show you a photo of my previous design and obviously the new one with the pattern. It stems from my Spinosa Square just without the ldc stitches and a join as you go method is used to add the daily square to the previous one. So here is the old design…. As you can see here I have nominated a colour for each 2 degrees. There are lucky people out there who would have such beautiful rainbow blankets because of the climate they live in. And as we all know, I am a green fan (which wouldn’t work well if I had used the ‘traditional’ colour scheme, because of where I live). Anywho… here is the new pattern and square…. For this blanket am using 8ply (dk) acrylic from Spotlight and Big W as that is what is in my stash and a 4mm hook. You will also need a yarn needle and some scissors. I also used the starting stitch method and joined without a slip stitch. You can find both methods here on the blog. Round 1: Make a magic ring, ch3, 11dc in ring. Round 2: Make a starting sc in any st, 2sc in next st, ch2, *2sc, sc, 2sc, ch2*, repeat around finishing with 2sc in last st. Round 3: Make a starting dc into the starting st from round 2, dc in next 2 sts, (dc, ch3, dc) in corner, *dc in next 5 sts, (dc, ch3, dc) in corner*, repeat around finishing with dc in last 2 sts. Round 4: Make a starting sc into the starting st from round 3, sc in next 3 sts, (2sc, ch2, 2sc) in corner, *sc in next 7sts, (2sc, ch2, 2sc) in corner*, repeat around finishing with sc in last 3 sts. For joining as I mentioned earlier I used the join as you go method, you can see this in my Sunshine Cushion pattern. You will need to border one square first, here’s how: make a starting sc into starting st from round 4, sc in next 5 sts, (sc, ch2, sc) in corner, *sc in next 11 sts, (sc, ch2, sc) in corner*, repeat around finishing with sc in last 5 sts. I used the lowest temp of the day for round 1, a neutral colour to add some ‘pop’ in rounds 2 and 4, the hottest temp for round 3, and the border colour for round 5 (joining colour ). Each square measures approximately 8cm or just over 3 inches. 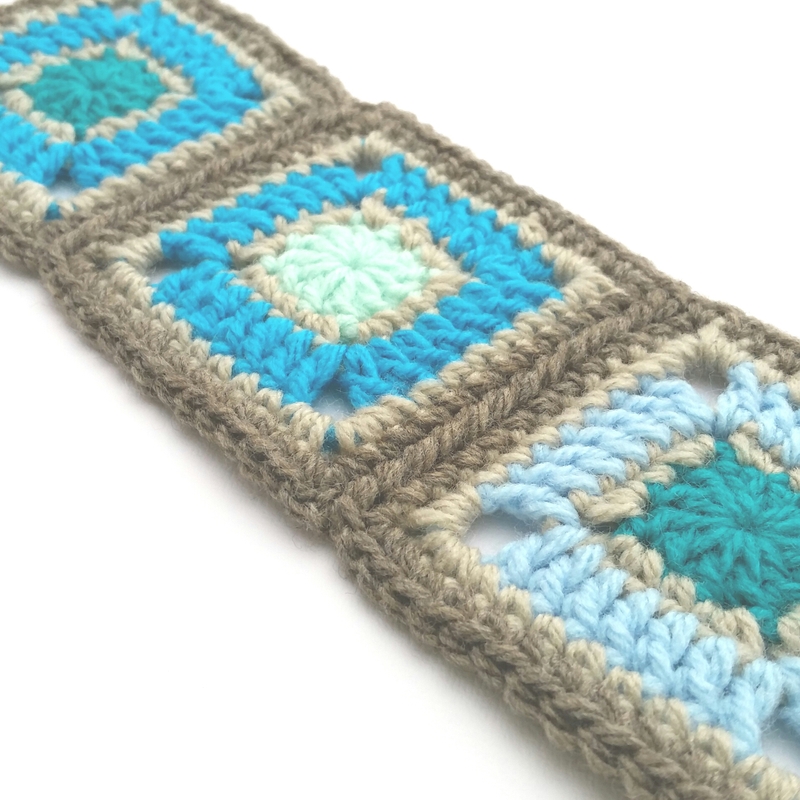 Once I have crocheted all the squares, I plan on adding a few more rows for a bigger border in the two neutral colours. I hope you enjoy making one if you do or just using this pattern for a blanket, cushion etc.